Is Mari Kristin Beach Hotel open year round? Beach Hotel Mari Kristin is open from May until October. Is Mari Kristin Beach Hotel situated in a quiet or a loud environment? Beach Hotel Mari Kristin is situated in a residential area in Hersonissos. To Hersonissos' centre it is a few minutes' stroll. We sometimes have noise issues in the early morning (garbage collectors). Our hotel staff is Greek, English and French speaking. Check in is at 14:00h and check-out is at 12:00 (noon). A late check-out can be arranged at a small charge on request and upon availability. Does Beach Hotel Mari Kristin provide parking space? Our property does not include a private parking space. There is secure street side parking availability for your bike or car. Are pets allowed in Beach Hotel Mari Kristin? No, we're sorry, but pets are not welcome in our hotel. Personally we have nothing against them, but not all guests at Mari Kristin are charmed by pets. In case of emergency, can I consult an English speaking doctor? Yes, there are excellent English speaking doctors in Hersonissos. Hersonissos has an excellent private medical centre on a 24/7 base, as well as a qualified dentist and several pharmacies. Power supply in Greece / Crete is 220V. Sockets accept two-round pin plugs. Adaptors are readily available at any supermarket, or just ask our friendly staff to help you out. Power cuts happen occasionally, especially in summertime, due to strained generating capacity. What are the shop opening hours in Hersonissos? Bus services are operated by the KTEL cooperative and buses are fast, frequent and comfortable. They leave in both directions from Hersonissos's main road about every 20 minutes, to Heraklion in the west and to Agios Nikolaos in the east. There are plenty of highlights and places of interest to visit in the area. Have a look at our section 'Hersonissos' in the box on the left. Heraklion, Crete’s capital, is some 25km west of Hersonissos (35min. by bus, 20min. by car). Heraklion International Airport is about 22km west of Hersonissos. Yes, Mari Kristin provides internet access and has a free Wi-Fi zone. Mari Kristin offers her own bike and car rentals. Ask our friendly staff to assist you. How far is it from the hotel to Hersonissos Down Town and to the beach? 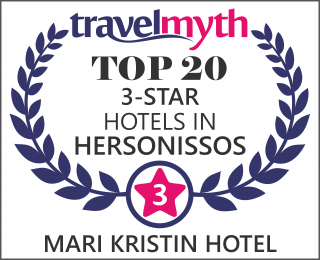 Beach Hotel Mari Kristin is located in a residential area in Hersonissos, next to the beach (10 metres away). Hersonissos's inviting taverns are practically at your doorstep. (See also Location).